There was no time yesterday to write a log entry. So much happened that it would have taken too long and we didn’t get back to our tents until well past eleven at night. Yesterday was probably the longest day of the trip so far and certainly the most hectic and eventful. Just about every conceivable emotion is represented somewhere during yesterday’s events and it will take me a while to summarize everything. For a refreshing change, we did not have to get up too early, as the drive to Victoria Falls in Zimbabwe was not anticipated to be a long one. I knew the day would be different when I woke up, popped my head out of the tent and realised that the sun was actually shining. Having spent the past three weeks getting up so very early in the morning, it was actually a bit op a shock to my system to see broad daylight and it took me a few moments to get my bearings. During breakfast, a type of Hornbill bird (Theron did tell me which type but I can’t remember right now) had perched itself on top of the huge tree that we were all sitting under and it started ‘crying’ like a baby. Not only crying but also ‘screaming’ like a baby too every now and then. It was extremely loud and sounded very convincing. The previous night, there was a child screaming and crying a few tents away from us and I was almost convinced that this was the same child performing again – just a little higher in the tree canopy. I don’t know if the bird was mimicking sounds that it had heard, like a Parrot would, or whether this was the sound it usually makes but it was quite a shrill and I would have targeted the annoying thing with a catapult if I’d had one. We were soon packed, on the truck and on our way towards the Botswana/Zimbabwe border. Since most of the remaining compliment of the tour is English citizens, we were all a little apprehensive about the border crossing into Zimbabwe. Over the past several months, I’ve heard and read about stories of problems with people, English people in particular, crossing the border. The ongoing political and economic problems in Zimbabwe were foremost on our minds. Corruption seems to be a big problem in this country (it is a problem in a lot of African countries) and we were worried that we might be shook down for a bribe if not refused entry altogether. At the border crossing, the immigration officer basically has your life in his hands and can pretty much do whatever he wants and there is absolutely nothing you can do about it other than to just be nice, smile and hope he’s in a good mood. Up till recently, we had planned on not actually going into Zimbabwe but rather to see the Victoria Falls from the Zambia side. Since our tour terminates here in Zimbabwe, we didn’t really have much of a choice anyway. Also, the natural wonder of the falls is best viewed from the Zimbabwe side and we did already have a plan for accommodation here on the Zim side. It was just a short half-hour drive to the border. This took me by surprise as I was expecting a two-hour drive. When the truck stopped at the Botswana departure post, I remember feeling that I was taken by surprise that we had arrived so early and that I was consequently not quite psychologically prepared for the Zimbabwe immigration ordeal. We cleared the Botswana side with the usual formalities and then drove the short distance through ‘no-man’s-land’ to the Zimbabwe border crossing. Theron came back to the truck after a few minutes away with a handful of forms that we had to fill in. We’ve gone through this procedure at every border crossing so far so this was nothing new for us and we all filled in the forms duly. Then we all walked into the immigration building and I think I was actually shaking. One by one, we handed in our passports and forms. The immigration officer asked us each what our nationalities were and informed us of the fee for the single-entry visa. For UK citizens, the fee is $55 (the highest for any nationality and quite a steep sum for any border crossing). Zimbabwe is one of the only countries where they will not accept their own currency as payment for the visa. Foreign citizens must pay in ‘hard’ currency such as US dollars, pounds sterling or Euros. The currency is now so weak in Zimbabwe that even the highest denomination of bank note is worth just a few penny in hard currency and there are a lot of situations where the local money will simply not do you any good. The immigration officer decided to process all of our visas at the same time and relieved each of us of our respective fees before disappearing into a back room for five minutes or so. This was a very tense time for all of us, as we had no idea what was going on back there. He came back, empty handed, and asked how we were planning to leave the country. At this time, I just happened to be the closest person to the counter and instinctively blurted out that we were planning on flying out. He then walked back into the back room and I suddenly had a horrific premonition. What if he came back again and demanded to see the air ticket as proof on onward journey – as is sometimes a requirement to enter certain counties? We don’t actually have any pre-booked travel options for leaving Zimbabwe (the plan was always to figure something out once we were here) and so would not be able to present such proof if demanded. Suddenly, I had visions of being ‘detained’ and being locked away in an interrogation chamber, strapped to a chair with a bright light shining into my face as a huge, black, angry military interrogator worked me over for information. After another few minutes, the officer came back with a handful of passports and a rubber stamp. One by one, her opened the passports, and whacked each one with the stamp. As each person's passport was stamped, that person breathed a huge sigh of relief. Of course, mine was at the very bottom of the pile and so my relief was a long time coming. Amazingly, the officer even smiled when he handed back the pile of passports to us and we were all very appreciative – and left very quickly, I might add. It seems that we were all to be spared the terrors of the Zimbabwe border crossing – for today at least. The drive from the border crossing to Victoria Falls took another hour and a half and we went straight to a place called Shearwater Adventures in town to check out some of the activities that are on offer here and to change up some money. Shearwater is one of a number of adventure activity operators in town and is situated in the middle of all the activity. A lot of overland tours begin, terminate or go through here so there is a huge backpacker culture here. Accordingly, there are also a huge number of touts that continually approach anyone who looks like they are not from here. They are continually hassling you to buy something or to change money on the black market for you. The consistency is quite intrusive and it’s actually quite intense. You get an overwhelming sense of culture shock that none of us were quite prepared for. Once we were inside the Shearwater Adventures shop, we were all sat down and shown various videos as the representative delivered his sales pitch for the various activities. The shop is right on the main street with very large, open, full-length, sliding glass windows and so there is just barely the sense that you are actually inside the building. Several touts were standing at every open window and some were even continually whistling to get our attention in the hope that we would buy something or otherwise do business with them. We were not the only group in the shop and the whole place was humming with frantic activity that you simply could not escape from – even by leaving the shop. Phones were ringing and it was difficult to concentrate with everything going on. During all this, we were trying to decide what, if any, activities we wanted to participate in (bungee-jumping, flights over the falls, canoeing, etc.). We were also trying to change money and pay for things – some with traveller’s checks and some with cash. It was absolute bedlam. Tempers were starting to fray a little when one of us was accidentally charged quite a bit more than the advertised price for one of the activities. The fact that you get such a ridiculous amount of Zimbabwe dollars for a single US dollar together with the fact there is the ‘bank rate’ and the ‘black-market rate’, makes verifying that you’ve paid the correct amount quite difficult. It took a fair bit of persuasion and some patience to get the staff to realise that they’d made a calculation error but the problem was ultimately rectified. If you pay for any activity by traveller’s check or credit card, you must use the bank rate of exchange, which is about 850 Zimbabwe dollars to one US dollar. The black-market rate is close to 1150 Zimbabwe dollars to one US dollar. I changed up $100 and collected a stack of Zimbabwe five hundred dollar bank notes about five inches tall. It looked ridiculous. To add to the frustration of everyone in the group, it quickly transpired that the Zimbabwe currency was next to useless for anything significant that you needed to pay for. All activities and transportation (flights, buses or whatever), for example, must be paid for in US dollars. Even to visit the falls, there is a twenty US dollar charge that cannot be paid for in local currency. Several of the group became quite disgruntled with the fact that they had changed up some money into local currency only to learn that they could not use it for anything other than meals and perhaps to buy some local curios of handcrafts. This is a very strange country. As if all this weren’t enough, we had our own little crisis to deal with also. Our plans were to meet up with Bertie & Mags and to spend a few nights with them here at Victoria Falls. We were particularly looking forward to this as an opportunity not only to see them again but also to give us a chance to unwind and relax from the rigors of the tour. During the pandemonium, I called the lodge and asked for them so that we could make the necessary arrangements to meet up with them. Unfortunately, the receptionist I spoke with had no record of anyone of that name currently staying at the lodge. Oh crap! [I would ordinarily use the s*** word here but my updates bounce back from some people due to their company’s profanity filter blocking the e-mail from getting through] The only thing I could think of was that they might have had to cancel their trip unexpectedly. By all accounts, this was a major problem as it meant that we no longer had any accommodation here. By now, my own stress levels were through the roof and I was starting to get despondent. Things did settle down eventually and we each decided to take a ride on the ‘booze cruise’, which is a trip up the river with all drinks and snacks included. The two guides, Toby and I also opted for the bungee-jump. 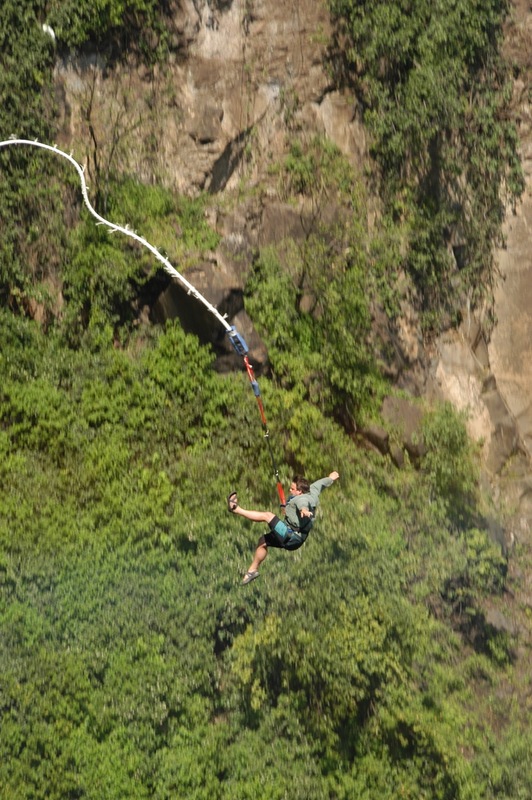 Up till now, Sandy has always been rigidly insistent that I was not allowed to do a bungee-jump but weakened a little yesterday when she saw just how interested I was and that it could be done feet first with the bungee cord strapped to the chest as opposed to the feet. This would be a belated birthday present for me. I was more than a little anxious about the jump but since this was something that we had, jokingly, argued about me doing for a couple of years now, I couldn’t lose face and not take advantage of the opportunity. As was the case with the border crossing, I was hoping to psyche myself up for the jump to take place today but the group decided that we would go immediately to the bridge and get it out of the way as quickly as possible. My legs and hands started to shake but I did my best to put the thought out of my mind for as long as possible – which, unfortunately, turned out to be less than an hour. The bridge from which the jump takes place marks the boundary between Zambia and Zimbabwe. Since the jump actually takes place on the Zambia side (by just a few feet – literally), we had to first pass through the Zambia immigration checkpoint before reaching the bridge. We all needed to take our passports but in the event, they were not needed and we did not get the Zambia stamp, much to Sandy’s disappointment. There is actually a pretty good view of one section of the falls from the bridge so we were all pleased about that. The water right now is extremely high and the violently raging torrent floodwaters in the gorge below us were a sight to behold. After a few formalities (indemnity forms and weight checks), we all proceeded back to the centre of the span where the four of us idiots got fitted with harnesses. As we were being strapped in, the very well trained staff had all sorts of things ready to say to us. Some were safety related but most were designed to scare the wits out of us. Things like: “We haven’t had any fatalities this year, but you ‘should’ be safe”, and “Why are you going feet first? It’s much, much scarier this way.” They were also taking digital photos and a video of everyone as they jumped. My instructions were to jump backwards off the platform and to stay straight, with arms and legs stretched out like a star, all the way down. As I jumped, I felt myself lean over backwards and desperately tried to swing my arms and legs, as if peddling a bike backwards, to straighten myself. The fall seemed like it would last forever and I distinctly remember myself thinking that it was a very long way down – 111 meters to be exact. The jump was a complete thrill and definitely an experience of a lifetime but I’m still not sure I’d want to go feet first – like the other three lunatics did. With the excitement of the jump over, we went back into town to pitch our tents and to grab a quick lunch before heading out on the ‘booze cruise’ which, by now, was rapidly approaching departure time. After pitching the tents, I went back to Shearwater Adventures to try the lodge again to see if I could reach Bertie and Mags. I must admit that this was somewhat wishful thinking on my part in the hope that the problem earlier was simply a communications breakdown between the receptionist and myself. I got a different receptionist this time around and took my time explaining the situation. Just as I was contemplating making some enquiries as to where we might stay after tonight, the receptionist confirmed that they were, indeed, at the lodge. I left a message to inform them that we would contact them in the morning to make the necessary arrangements. Finally, the day was starting to look a bit brighter. We all had a good time on the boat, as it was just our group and Theron. The two guides did not go. It wasn’t long after returning that a decision was made to continue to unwind at the local drinking hole and we all walked the short distance into the same town centre that we had all ‘collided with’ earlier in the afternoon. The ‘Explorers’ bar was a quaint yet fantastic place for everybody to unwind and let of a bit of steam with some eating, drinking and plenty of disco-style dancing to some fantastic music from the era that the majority of us had all grown up with. It was truly a wonderful evening and everyone, myself included, spent a lot of time on the dance floor. The food was good (and extremely cheap – fish & chips was 1000 Zimbabwe dollars, which is less than one US dollar with our black-market bank notes) and the atmosphere was even better. The place has a backpackers feel to it and there are humorous sayings plastered all over the walls. During the evening, other groups of overlanders that we had met at various points along the way also came in to unwind and we shared adventure stories with each other. After three weeks of early mornings, long drives, camping, stressful situations mixed with adrenaline activities and wondrous experiences and being continually filthy, everyone really needed this much welcomed tension release. The whole group bonded really well and it was just about the most perfect end to the tour that could have been planned. The previous day, we had all ordered some printed T-shirts with maps of Africa and a dotted line depicting the route that we took through the continent on one side and various other bits and pieces printed on the arms and front – such as the tour company logo. Half way through the evening, Theron came in with them and stood on a table and handed them out. We all cheered as we received our T-shirts and everyone put them on. It solidified even further the bond between us all as we all had very similar T-shirts and it was clear that we were a group together. The other overlanders had done the same and you could tell which tour group everyone was from just by looking at what they were wearing. Everyone realised just how much we had grown close to each other on this trip and it was fun and merriment for several hours past the time that our internal body biological clocks were telling us all it was time to sleep – which was only about eight or nine o’clock. It was well past eleven in the evening before we broke up and slowly headed back to the camp-site.